Congratulations to Jo who has just launched her first product range, Lovestamp. 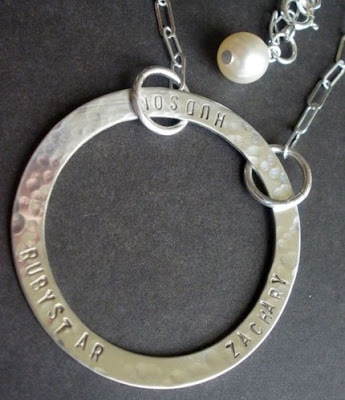 Jo's jewellery line includes lovely sterling silver necklaces hand-stamped with the names or initials of your loved ones. These would be a perfect gift for a Mum to keep her little one's names close to her heart all day. Jo has even whipped up a lovely gift for expectant mothers - the delicate Pea in the Pod necklace. So sweet. Queensland-based Jo is also having a launch giveaway on her site; head on over for a chance to win a necklace. You can find customised Lovestamp jewellery on Etsy (for international buyers) and Madeit (for Australian and NZ buyers). For more information about Jo's world, check out her blog Jogirl's Journey. You'll also Lovestamp at the upcoming Mathilda's Markets in Brisbane on 19th July, 2009.